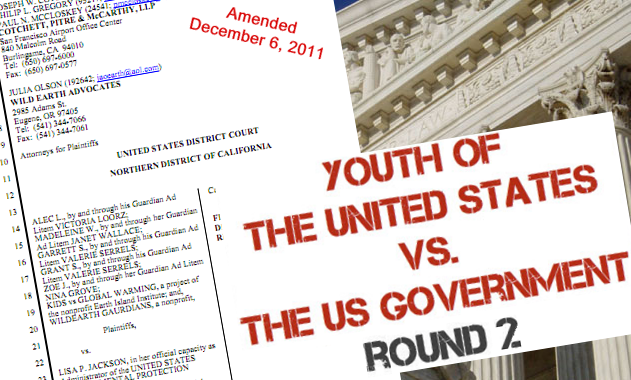 Youth of the U.S. vs. the U.S. Government - round 2. “Our children’s trust” launched a second wave of its climate change initiative after an opinion was made by the District Court in California on Dec 6, 2011. The second wave, launched in Washington D.C., is targeting the U.S. Government. More to be found here at the climatelawyers.com website or on the website of “our children’s trust”. The first wave of lawsuits launched in May 4, 2011 by Alec Loorz, an, at the time, sixteen year old environmental activist, and other youths, together with Kids vs Global Warming and Wildearth Guardians. The plaintiffs filed State-level lawsuits against several government offices and bureaus in California, Colorado, Minnesota, Montana, New Mexico, Oregon and Washington, and a federal lawsuit targeting Lisa P. Jackson the EPA Administrator, Kenneth Salazar Secretary of Interior, Thomas Vilsack the Secretary of Agriculture, Gary Locke the Secretary of Commerce, Steven Chu the Secretary of Energy and Leon Panetta Secretary of Defense. The federal lawsuit was filed in United States Ninth Circuit District Court in San Francisco California because of this jurisdiction's friendliness to environmental concerns. This was probably why another climate change lawsuit, Native Village of Kivalina v. ExxonMobil, may also have been filed in the Ninth Circuit Court of in San Francisco California. In the original filing, our children's trust argued that the atmosphere is a public trust within the hands of the U.S. Government. The public trust principle states that the government holds important and non-renewable natural resources in “trust” for the public, thereby making it a trustee. In this position as trustee, the government is required to protect these natural resources for the beneficiaries of the trust, namely citizens and future generations of citizens. Under this doctrine, the government must not allow private interests to cause irreversible damage to critical resources within the public trust, which in the case of climate change is the clean atmosphere. The second wave moves the federal suit to Washington D.C. because of the national significance of the case which could additionally provide the lawsuit with more media coverage. This case does not deal with climate change damage compensation which is the main focus of this website therefore we refrain from a detailed report. For more information see the websites ourchildrenstrust.org or kids-vs-global-warming.com. Related: It the U.S. really the best jurisdiction for Climate Change Damage Lawsuits?